Hepatitis C represents a major public health challenge but patients now have the opportunity to be completely free of the virus through a short course of treatment. This guide will help you to recognise stages and symptoms and offer people the targeted help they need. Read it online as a E-Magazine or download the PDF. 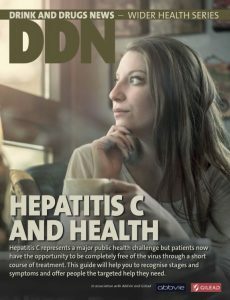 The publication was a printed supplement in the October 2018 DDN magazine, but we would be happy to post additional copies to your organisation free of charge to distribute to members of staff. Please fill in the form below. Order free printed copies for your organisation.